How can we live at home without fossil energies? We will compare these houses and explain why it's ecologically interesting. There is also a website very cool about alternative houses there. I What are the different ecological houses? How does it work ? How can we make it ? Tinyhouse : Website « flickr » taken by Nicolas Boullosa, on internet since september 2th 2009, licence « creative commons ». Yurt : Website « flickr » taken by Antoine Gady, on internet since october 5th 2011, licence « creative commons ». Raw house : Website « flickr » taken by Oyvind Holmstad, on internet since april 27th 2017, licence « creative commons ». Earthbag house : Website « flickr » taken by Justin Martin, on internet since march 20th 2010, licence « creative commons ». There is a nonprofit organization which offers a training to build super-adobes houses in the USA, California there. The french organization "Gold of Bengal" is picking up all the low tech around the world and give them freely on this website. A woman who built her own earth bags house and gives books to help people to build their house themselves there. Here the house's construction . An another website that explains earthbag building here. Sustainable : This word is a synonyme of « durable » or « long term ». It describes something lasting over time. Recycled : A garbage recycled means we use it once again. We usually change it for an other use. Sewage : This word defines waste water from toilet or shower for example. Self-sufficient : This word is used to describe an entity providing its proper basic needs. Tires : Tires are the rubber cylinders around wheels from cars or bicycle for instance. In earthships, we use it as the walls structure. Renewable :This word describes something endless. For example energies produced by winmills or solar panels are defined as renewable energies in contrast to fossil fuels. Usually, renewable systems are using natural elements. Straw bales : It's a groupment of stalk of wheat. They built houses with this materials. Available in abondance : It means that there is a lot of this resource in nature because there is a lot of wheat cultures and it's not often used. Effective insulation : There is a double advantage: We use the straw for walls and for insulation. Clay : It's the natural material that coat the straw walls. Off-the-grid : An off-the-grid house is a house which is disconnected from the general system (water, gas, electricity). The owners will not be reliant on big companies and they will be self-sufficient. Footprint : This word describes the trace we let behind us. It's used for example to speak about human impact on nature, we say « ecological foot print ». Efficiency : Being efficient is using as minimum materials, time and efforts as possible to accomplish something. The ratio energy developed / energy supplied has to be maximum. Passive heating : A passive heating system takes advantage from natural elements in order to be efficient. With that system, we aim to use less supplied energy as possible. Eco-friendly : An eco-friendly house is designed to don’t harm the planet or maybe to have a positive impact on it. Can we build an autonomous environnementaly friendly house? If you want to live in a sustainable way without harming the earth, there are some ways to build autonomous and ecofriendly houses. 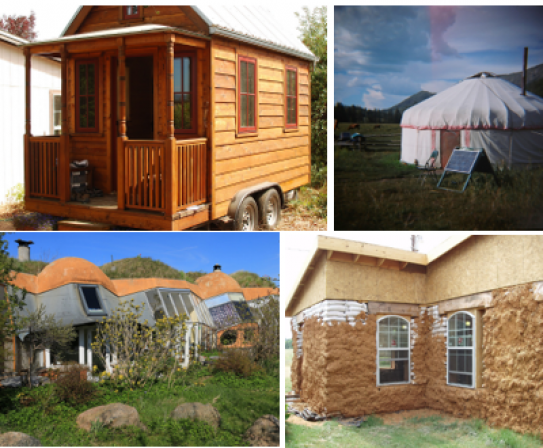 There are many different types of eco-constructions : tiny house, kerterre, yurts, bamboo house, earthship, straw bales house, raw earth, earthbag house, and so on. We can use various materials to build these houses : natural elements like straw or soil and recovery items like tires or cans. You can use solar panels, a rainwater collector, an underground fridge and other equipments not using fossile fuels to go further in the process. Those constructions are designed to take advantage from natural elements and to maximize the effeciency of the house. In this way of life, people will be able to provide for their proper basic needs. They are self-sufficient and they are not reliant on big companies. The question is : Even if you are at maximum effort, is your house really autonomous and environnementaly friendly? Using recovery materials like tires or cans make your home non compostable ! At this day, solar pannels are built with rare materials difficult to extract and they are not recoverable. Can we really say these houses are autonomous and ecologic ? "What is an ecological house ?"